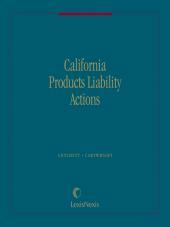 The complete California Evidence Code with the information you need to interpret and apply it. California Courtroom Evidence is updated in an easy-to-use, portable softbound format. 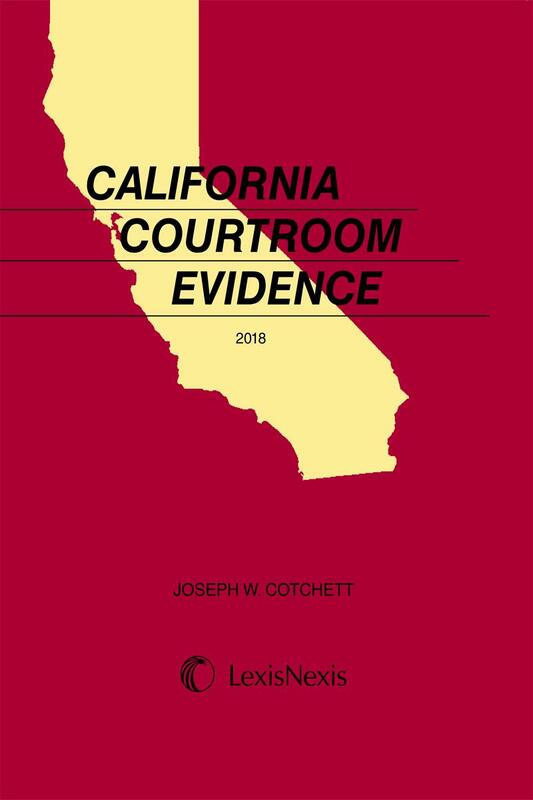 It includes the complete California Evidence Code, legislative history on each code section, Law Revision Commission comments on most sections, relevant, insightful case annotations, and practical pointers from Joseph W. Cotchett, highly regarded California trial lawyer and expert on evidentiary matters. 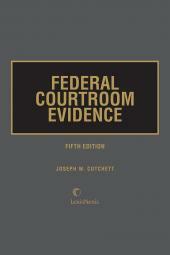 Invaluable in civil and criminal evidentiary matters, this edition is organized for easy use. 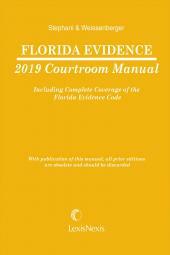 The publication uses a "Speed Index" for quick reference, a topical index to quickly find Evidence Code sections, and a quick-reference list of common courtroom objections to make your evidence research more efficient. In addition, this edition contains useful finding tools like a complete detailed index, table of cases, central index and tab features, and a handy rear cover margin index to find topical code groups quickly. Managing partner at Cotchett, Pitre & McCarthy in Burlingame, CA; Well known and highly respected trial attorney across the US; keynote public speaker and lecturer on contemporary subjects of law; author of numerous articles, books, and contributing author to numerous magazines; Active member of national, state and local bar associations; Fellow of the prestigious American College of Trial Lawyers and The International Society of Barristers; Advocate in the American Board of Trial Advocates; Fellow and former board member of The International Academy of Trial Lawyers; Former Master of American Inns of Court, serves on various advisory boards for professional organizations; Served on Advisory Board of Witkin Legal Institute; 1972 to 1975 State Bar of California Board of Governors; 1976 to 1980 California Judicial Council; Board of Directors, Hastings College of Law, University of California for twelve years; California Commission on the Future of the Courts; California Select Committee on Judicial Retirement; California Blue Ribbon Commission on Children in Foster. Serves on Federal Judicial Advisory Committee that submits and reviews federal judicial nominations in California to President Obama; Chair, Boxer Committee for Central District of California, Los Angeles and advises statewide; serves on a Judicial Advisory Committee to Governor Jerry Brown on state judicial appointments. 1999, was inducted by the State Bar of California to the Litigation Trial Lawyers Hall of Fame. 2000, University of California Hastings College of Law opened the Cotchett Center for Advocacy recognizing him as one of its outstanding graduates, honored by Chief Justice Ronald M. George, California Supreme Court, and Associate Justice Anthony Kennedy, U.S. Supreme Court, at the Founder's Day dedication of the center. 2006, Notre Dame de Namur University in Belmont, California dedicated the Joseph W. Cotchett Business Lab for students. 2000, named to the California State Parks Commission by Governor Gray Davis and served as Chairperson 2002-2003. 2003, honored by Disability Rights Advocates for nearly 40 years of civil rights work. 2004, continuing a distinguished history of community and civic involvement, endowed $7 million fund to support science and math teacher education at Cal State Polytech to serve inner city and rural minority children. Honored by university renaming its landmark Clock Tower building the "Cotchett Education Building." 2011, inducted into the prestigious American Trial Lawyer Hall of Fame for work nationwide in civil rights and litigation on behalf of the under-privileged in our society; received Distinguished Service Award from the Judicial Council of California and named Antitrust Lawyer of the Year by the State Bar; honored by the California League of Conservation Voters with the Environmental Leadership Award and honored by Consumer Watchdog with the Lifetime Achievement Award.